LEONARD PARKINSON, a prominent farmer, stock-raiser and dealer in real estate, residing on section 30, Oconee Township, Shelby County, was born on Staten Island, N. Y., January 21, 1831. His parents were Leonard and Maria (Fountain) Parkinson, both being natives of Staten Island, and descended from English and German ancestry respectively. Two sons and two daughters were the children of this marriage, as follows: Mary E., the widow of William Burns, is at present in Europe where she has been spending seven years educating her daughter; the next, is our subject; William A., who is unmarried is engaged in the insurance business in the East, and makes his home upon Staten Island; Hannah S. is the wife of John Benjamin, a broker of New York City. The mother died five years ago in her eighty-third year, having been a widow since 1852. The subject of this sketch was educated in the schools of New York City, and grew to manhood as a resident of Staten Island. In 1848-49 during the prevalence of the "gold fever," he went to California and remained there for five years, being engaged in trading with the Sandwich Islands, and in the brokerage business, in both of which he was successful in a financial way. In 1853 he returned to Staten Island, and in 1861 came to Illinois and located on the farm in Oconee Township, where he now resides. He owns two hundred and sixty-two acres of excellent farming land, adjoining the town of Oconee. A fine residence tastily furnished, productive orchard and other advantages render this farm a very desirable one. 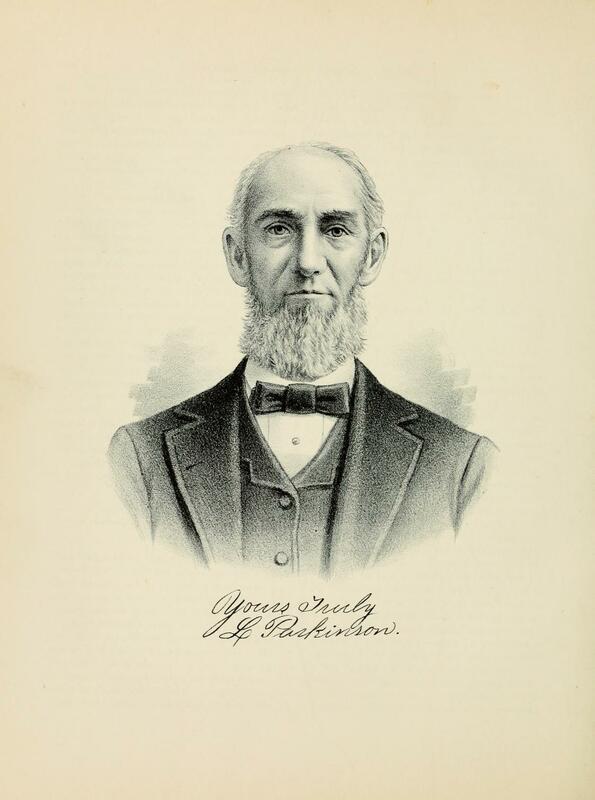 When Mr. Parkinson first came to Illinois he came to transact business in real estate for other parties, and seeing the country under very favorable circumstances he became impressed with its beauty and fertility, and invested for himself, which action he has never seen cause to regret. The marriage of our subject in 1863 united him with Miss Ann L. Elmo, who was born at Zanesville, Ohio, January 4, 1841. She came to Taylorville, Ill., with her parents, and was married at Oconee. Of this union three children were born: William A., who was born January 8, 1864, is engaged in merchandising at Sullivan, this State, and is married to Miss Jessie Shinkle of Ohio; Cora, who was born August 14, 1866, is now the wife of H. Skinner, of Oconee; Ida, who began life May 30, 1869, died when a lovely child of two years and seven months. Mr. Parkinson is a stanch Republican in politics, and takes an interest in everything calculated to enhance the prosperity of the State and nation. His family are not members of any religious denomination, although their preferences are toward the Episcopal Church. An honest, industrious and frugal gentleman, it is not strange that he has accumulated a goodly portion of this world's goods, and is able to give to his family the advantages of comfort and affluence. On another page of this volume will be found a lithographic portrait of Mr. Parkinson. Extracted 13 Jan 2018 by Norma Hass from 1891 Portrait and Biographical Record of Shelby and Moultrie Counties Illinois, pages 428-429.